So we don’t always have time for breakfast around this house. We usually rely on cereal or toast and sometimes bagels or English muffins. I mean theres nothing wrong with that at all, we are always on the go so it suits our needs. But sometimes we just want to slow things down and have something that is a little more homemade and flavorful and filling. 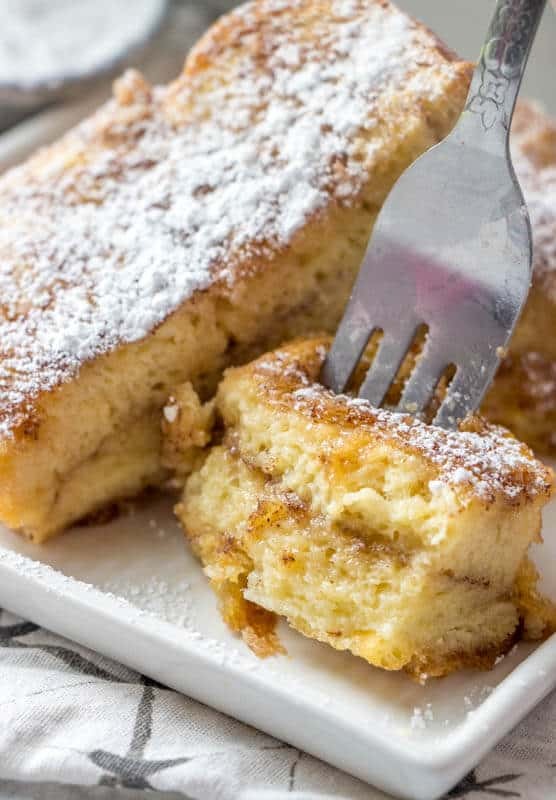 Luckily this Overnight French Toast Bake is little effort and still helps with our busy lifestyle because it is made the night before. 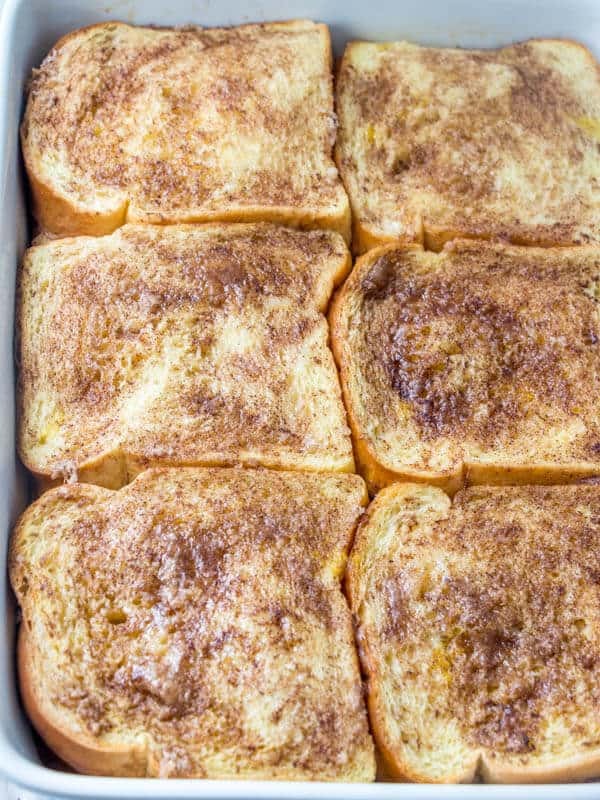 Just stick this baked French toast recipe in the oven in the morning and you’re set to go once everyone wakes up. 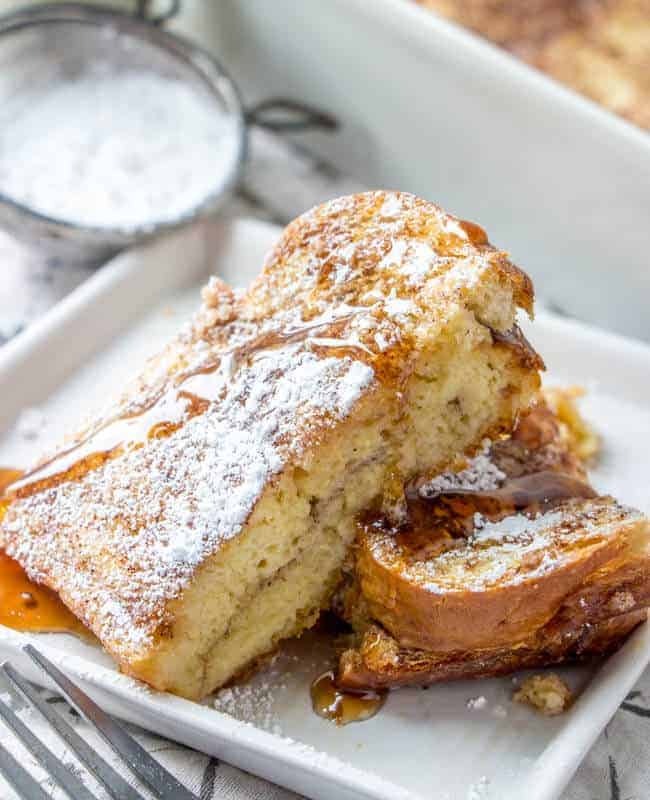 We also love to serve this for guests that stay over because it makes a bunch and who doesn’t love french toast. If you are a fan of cinnamon rolls this kinda has the flavor of those. 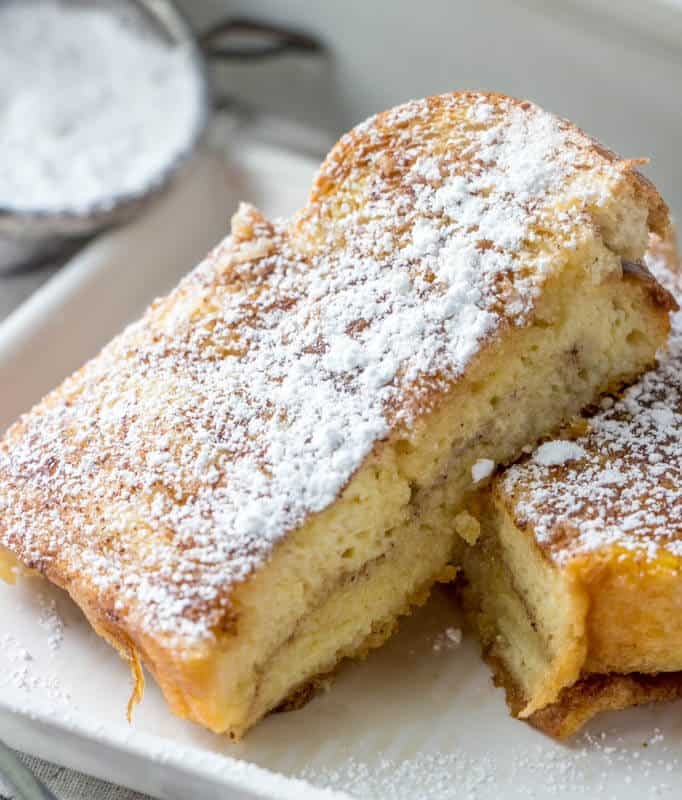 The bread is sprinkled with a cinnamon sugar mixture between the layers and on top so you get that sweet taste with every single bite. HOW DO YOU COOK FRENCH TOAST IN THE OVEN? 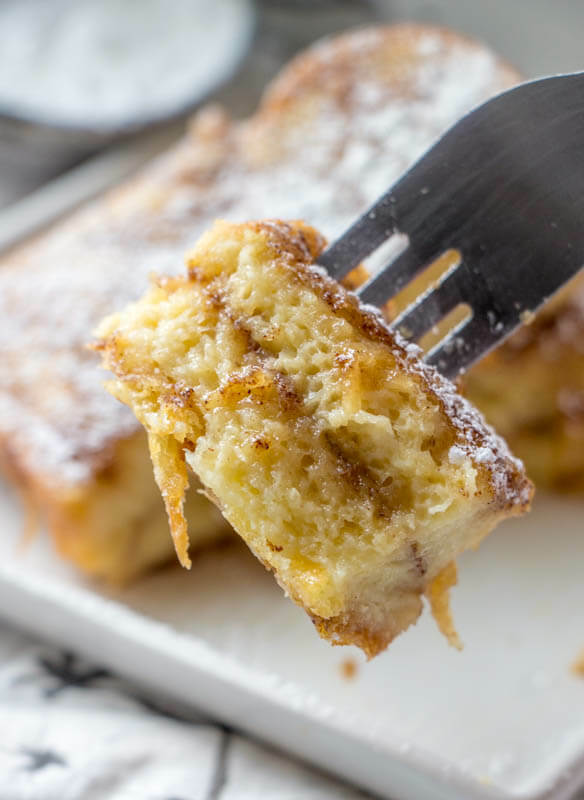 So for this Overnight French Toast Bake you coat the bottom of a 9″x13″ baking dish with melted butter. In another bowl mix together some brown sugar and cinnamon and set aside. You then layer 6 slices of bread on the bottom of the pan and then sprinkle half of your sugar sugar cinnamon mixture over the bread, then layer with 6 more slices of bread. In another larger bowl whisk together some eggs, vanilla and milk and pour that all over the top and let it soak in. Then sprinkle the top with the remaining brown sugar and cinnamon mixture and cover and refrigerate overnight. In the morning throw it in the oven and you have yourself not just an amazing smelling kitchen but an amazing tasting breakfast solution. You can serve this with powdered sugar or syrup or a combination of both. We like the combination of both because we are a huge sweets loving family so it’s only natural for us. HOW LONG DO YOU BAKE FRENCH TOAST IN THE OVEN? 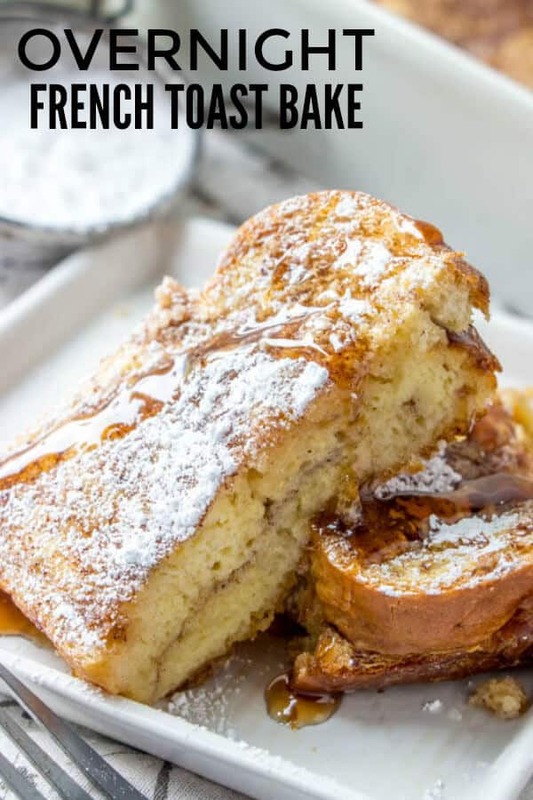 This French toast takes about 45 minutes to bake in the oven. Not a short cooking recipe but absolutely not a long cooking recipe either. It is so easy to begin with that waiting those 45 minutes to bake on up is probably the most worth it overall! 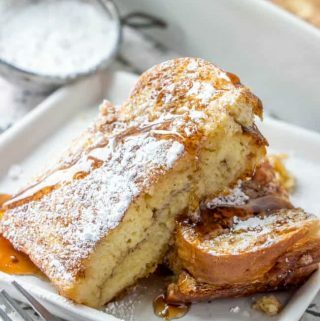 You can use a variety of breads in making any type of French toast. For this recipe we use just plain old white bread. We don’t always have those specialty breads on hand and we really don’t care so we just use the normal toasting bread for this recipe and we have never been disappointed. 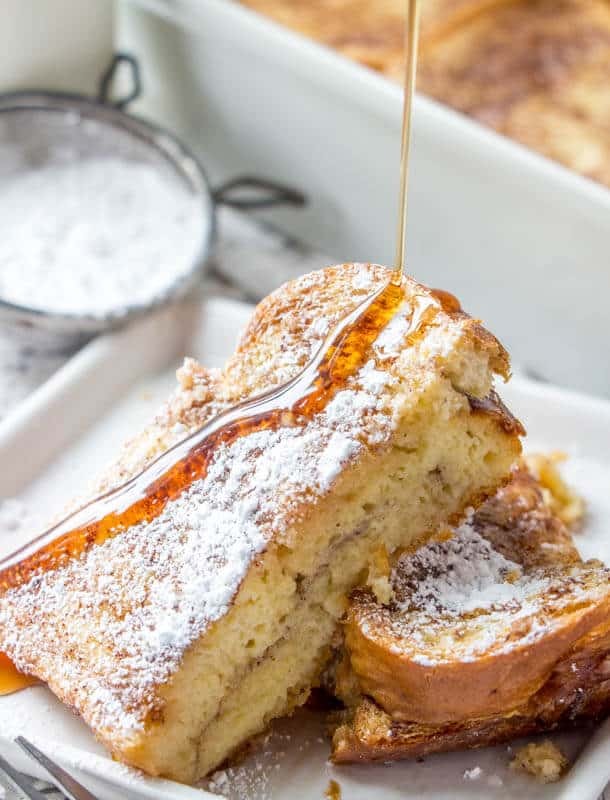 If you’re looking for a delicious and simple breakfast, brunch or brinner recipe then this Overnight French Toast bake needs to be on your must make like. Once you make it you will keep it on your rotation for good! In a 9"x13" pan pour your meted butter. Layer 6 pieces of bread over melted butter. In a small bowl mix together your brown sugar and cinnamon and sprinkle half over the top of bread. Top with remaining 6 slices bread. In a large bowl whisk together eggs and milk and pour over top of bread. Sprinkle with remaining brown sugar and cinnamon mixture. Cover with tinfoil and refrigerate 8 hour or overnight. When ready to bake preheat oven to 350. Place covered dish in oven and bake for 30 minutes. Remove tinfoil and bake and additional 15 minutes. Remove from oven and serve with powdered sugar and syrup if desired.